Patabandi Don Nandasiri Wijeweera known to the world at large as Rohana Wijeweera was killed twenty –five years ago on November 13th 1989.The revolutionary leader of the Janatha Vimukthi Peramuna (JVP) or Peoples Liberation Front was 49 years old at the time of his death. The mastermind behind two bloody insurrections – in 1971 and from 1987 to 89 – was taken into custody on Nov 12th in the Kandy district and brought to Colombo. With Wijeweera’s capture and death the second JVP insurgency petered down gradually and ended. The second JVP insurgency lasting for more than three years resulted in thousands of people being brutally killed by both the JVP as well as the counter insurgency forces comprising Police, para-military and security personnel. While no reliable estimates are available of the number of killings done by security personnel and other agents of the state, there are official figures of the killings done by the JVP. 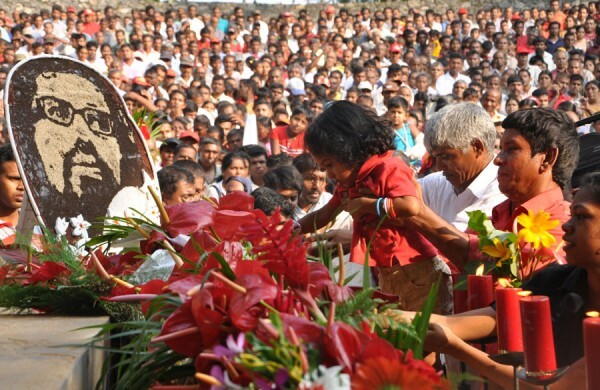 During this three year period, 487 public servants, 342 policemen, 209 security personnel, 16 political leaders , and 4,945 civilians of other descriptions were said to have been killed by the JVP. This tally included 30 Buddhist monks, 02 Catholic priests, 52 school principals, 04 medical doctors, 18 estate superintendents and 27 trade unionists. It also includes family members of 93 policemen and 69 servicemen. While all this mayhem and carnage was being unleashed the supreme revolutionary leader of the JVP posing as a planter named Nimal Kirthisiri Attanayake was living comfortably with his family and two servants in Ulapane,Kandy. Given the enormity of the violence caused by the JVP and the boiling anger amidst the Police and security personnel towards the JVP leader,it is widely believed that Rohana Wijeweera was killed in what is euphemistically termed as an “officially sanctioned unofficial execution”.The official version was that Wijeweera and another senior JVP leader H.B.Herat had been taken to a house in a Colombo suburb being used as a clandestine JVP office to seize some documents.However Herat had shot at Wijeweera while pretending to take out some papers.The security forces had shot both and killed them.They were later cremated. “The leader of the Sinhalese group that has been waging an anti-Government campaign of terror was shot to death today by Government forces while in custody, the Foreign Minister said”. “The Foreign Minister said that Mr. Wijeweera subsequently agreed to lead government security men to one of the front’s offices in a Colombo suburb”. “Once in the office, Mr. Wijeweera instructed a member of the front’s Politburo, H. B. Herath, to relinquish some documents, the Foreign Minister said. Mr. Herath pretended to do so, but instead pulled a gun and fired at Mr. Wijeweera. Government forces opened fire, killing both Mr. Wijeweera and Mr. Herath, the minister said”. “President Ranasinghe Premadasa has ordered an investigation into the shooting. Mr. Wijeratne, who is also deputy defense minister, said security forces had already cremated the bodies of Mr. Wijeweera and Mr. Herath under emergency regulations that allow them to dispose of bodies without further inquiry”. “The circumstances of Mr. Wijeweera’s death, if uncorroborated, seemed likely to prompt charges that he was murdered by the security forces. Such charges could aggravate the violence in the Sinhalese heartland”. “Mr. Wijeweera’s organization accuses the Sinhalese-dominated Government of selling out the country’s Sinhalese majority in an effort to make peace with ethnic Tamil guerrillas. More than 6,000 people have been killed in the past two years in the struggle between the Government and the People’s Liberation Front”. “Mr. Wijeratne, reading a statement from the army commander, Hamilton Wanasinghe, said Mr. Wijeweera was detained with his wife and five children Sunday afternoon in Ulapane village near Kandy, 55 miles northeast of Colombo”. “According to this account, the soldiers suspected Mr. Wijeweera’s identity, even though he had shaved his beard, trimmed his hair, gained weight and looked younger than his age. Mr. Wijeweera, who was born in 1943, acknowledged his identity and was taken to Colombo, the statement said”. “Mr. 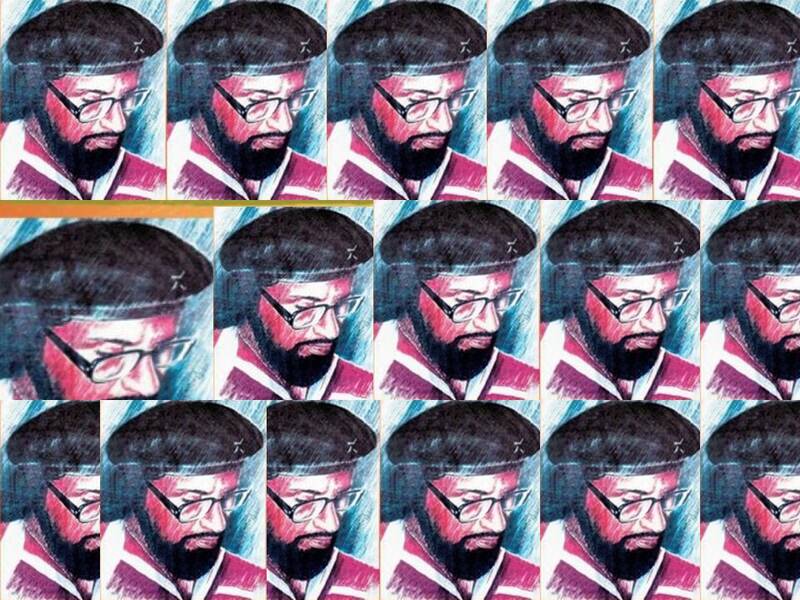 Wijeweera, who once studied in the Soviet Union, founded the People’s Liberation Front. The group has Marxist roots.The Government has blamed the front for most of the killings in the group’s campaign of terror. But human rights advocates and opposition politicians say many were revenge killings by Government forces or pro-Government vigilantes”. The Sri Lankan nation suffering terribly in the climate of JVP violence and counter violence was greatly relieved at news of Wijeweera’s death. Under the circumstances prevailing then the country was quite willing to go along with the official version trotted out. In private very few believed it. As is customary in such situations the rumour mills worked overtime and very many tales of the last hours of Rohana Wijeweera began circulating. The version accepted widely was that Wijeweera had been shot dead on the Colombo golf course premises in cold blood after being ordered to run. A senior Police official whose family members had been brutally massacred by the JVP had allegedly done the firing with senior army officers watching.Later on the two bodies had been incinerated at night in Kanatte.A macabre twist to this version was that of Wijeweera not being fully dead at the time of this cruel cremation. “On 12 November 1989, I paid a courtesy visit to my superior Colonel Lionel Balagalle, the Director of Military Intelligence. The time was around 8.00pm and the colonel was relaxing at home. While discussing activities of the JVP and also the LTTE, we had a few drinks. If I remember right, both of us had two each. The telephone rang. It was the commander of the army. The commander had an important message. Both of us were summoned to the residence of President Premadasa. Kandy by some army personnel, who had proceeded from Colombo”. “After the telephone call we became cold sober. We were both in civilian clothing. Still we had to go. Mrs Balagalle was quick to give us a few cardamoms to neutralize the ‘aroma’ of the liquor. We were well received by the security staff at the ‘Sucharitha’, the residence of President Premadasa. Both of us sat close to each other at the conference table. Five minutes later, HE the President arrived with a smiling face and shook hands with us. We got into conversation. I was trying hard to remember all about Rohana Wijeweera and his JVP. But, to our dismay, His Excellency fired a barrage of questions about the LTTE. We managed to answer all questions. Just then, General Cyril Ranatunge, Secretary of Defense walked in, followed by Lt-Gen Hamilton Wanasinghe. Gen Wanasinghe informed the President that Rohana Wijeweera had been brought to Colombo, and that both of us were required to question Rohana Wijeweera. HE the President thanked both of us and we followed the commander and accompanied him in his car”. “The time was 11.30pm. We reached the premises of ‘Operation Combine HQ’. There were many officers of other services too. We were conducted to the conference table where Rohana Wijeweera was seated. I was given a chair just opposite Wijeweera across the table. I commenced having a conversation with him. Mr Zernie Wijesuriya, Director, National Intelligence Bureau, his deputy and some others were present. I spoke to Rohana Wijeweera at length”. “Whenever I questioned him in English, he answered in Sinhalese. In fact, he asked me whether I knew the Russian language. I replied in the negative. Rohana Wijeweera told me that his second language was Russian. He told me all about his personal life, initially at Bandarawela and later at Ulapane in Kandy. He was reluctant to talk about the activities of the JVP”. “While this discussion was going on, the ‘Operation Combine’ commander was with his deputy in the adjoining room, which was his office. Just past midnight, the deputy Defence Minister General Ranjan Wijeratne walked in and sat at the head of the conference table. Gen Wijeratne asked few questions, but Rohana Wijeweera did not respond”. “Gen Wijeratne joined the ‘Operation Combine’ commander in his office. We continued with our conversation. We had many cups of plain tea (dark tea), while talking. I made a request to Rohana Wijeweera to advise his membership to refrain from violence. He agreed after persuasion. So we managed to record his words and also his picture in still camera”. “After some time, a well-known Superintendent of Police arrived at the HQ Operation Combine. As the police officer walked in, he held Rohana Wijeweera’s hair from the rear and gave two taps on Wijeweera’s cheek. Wijeweera looked back, and having identified the officer said, ‘I knew it had to be a person like you’. The police officer joined the Minister and Operation Combined Commander”. “We continued with our conversation. Wijeweera related a few interesting stories. One day, a group of JVP activists had visited the residence of Nimal Kirthisri Attanayake [Rohana Wijeweera] at Ulapane. They demanded money for their movement. Wijeweera responded quickly by giving Rs100. The youngsters did not have a clue about their leader. Wijeweera was full of smiles when he divulged this story”. “The time was around 3.45am on 13 November 1989. I was informed to conclude the questioning and to take Rohana Wijeweera downstairs. Together we walked downstairs and were close to each other. Wijeweera held my hand and said, ‘I am very happy I met you even at the last moment. I may not live any longer. Please convey my message to my wife’. Rohana Wijeweera’s message contained five important points. They were all very personal matters concerning his family”. “Moments later, Wijeweera was blindfolded and helped into the rear seat of a green Pajero. Two people sat on either side of Wijeweera. There were others at the rear of the vehicle. Just then a senior police officer arrived near the vehicle. I politely rejected his invitation to join them. The Pajero took off. I joined Col Lionel Balagalle standing near the main entrance of the Operation Combine HQ building”. “We were having a brief chat when a senior officer came downstairs to get into his car. We greeted him. He was in a very good mood. But the atmosphere changed all of a sudden. A military police officer appeared in front of us. The senior officer blasted him for not accompanying Wijeweera and party. The military officer dashed towards his vehicle and sped away. The senior officer departed. We also went home thinking of a good sleep”. “Late in the morning I was busy getting Wijeweera’s photograph printed. No one would recognize Wijeweera without his beard. So I had to seek help and add the beard to Wijeweera’s photograph. It was done very well. Late in the afternoon there was a press conference at the Joint Operation Command. Minister Ranjan Wijeratne briefed the press”. The account by Gen.Munasinghe describes the penultimate stages of Wijeweera’s life to some extent but is dependent on the press conference in revealing details about how exactly he died. There is also little information about how Wijeweera was apprehended presumably because the General was not directly involved in that exercise. “Piyadasa Ranasinghe and H B Herat were arrested in Galaha. These were the two JVP leaders who met with Rohana Wijeweera frequently.Herat had told the whereabouts of Wijeweera after a brief interrogation. A few hours later Wijeweera was arrested at Ulapane, Kandy, at his well appointed estate bungalow where he lived, masquerading as a planter under the name of Attanayake”. “Col. Janaka Perera had got flustered by the confident air put on by Wijeweera and thought they had come to the wrong place. Still he had cocked his pistol, put it to “Attanayake’s” head and asked, “Oya Wijeweerada?”. “Attanayake”, fearing that the colonel would pull the trigger, had admitted that he was Wijeweera and said “I will come with you, but don’t harm my family.There were two women servants in the house other than Wijeweera’s wife, and all the women had started wailing as Wijeweera was led out”. This then was how Rohana Wijeweera was arrested in Kandy and later brought to Colombo.While in cstody a National Intelligence Bureau cameraman filmed Wijeweera’s voluntary appeal to the JVP to lay down arms and halt violence. Earlier, in 1971, after his arrest, Wijeweera had made a lengthy statement..His recorded statement in 1971 was more than 400 typed pages. But the 1989 statement was very brief.It was later publicised widely through the media. How would future generations regard Rohana Wijeweera ? Will History Vindicate him? “No political leader in Sri Lanka has engendered such sharp and conflicting views about his role in the country’s life as Rohana Wijeweera when he was killed at the age of 49. Justly so since from his own perspective Wijeweera sought to upset the apple cart, the consensus which the post-Independence elite of Sri Lanka whether they were capitalist, liberal or Marxist had arrived at in order to maintain the status quo”. “To both the right as well as the orthodox left he was the devil incarnate but to his followers he was a demi-god. Wijeweera himself quite revelled in this role. With his beard, his beret and his fiery speeches he was very much part of the political landscape of the time playing all the available roles on Sri Lanka’s impoverished political stage ranging from Devil’s Advocate to Presidential Candidate”. 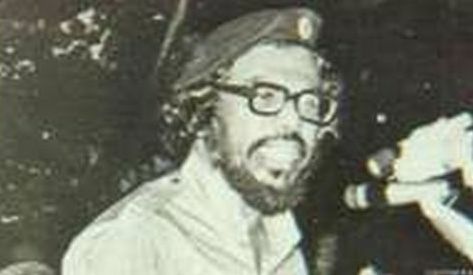 “From the point of view of his detractors Wijeweera was an opportunist who split N. Sanmugathasan’s Ceylon Communist Party and drew away its cadres to form his own private army with which he made a bid for state power in April 1971. From the view point of his admirers he was an idealist who mobilised the poor peasantry and particularly its marginalised younger sections who had been excluded from the established social system since Independence”. Which version approximates more to reality ? “Perhaps there is an element of opportunism in every political action and politics is an admixture of opportunism and idealism. But what can be safely said is that Wijeweera was the most audacious politician of his time in the sense that twice within a period of three decades he mounted two assaults on the Sri Lankan State safeguarded by the ramparts of the post-Independence consensus between the Left and the Right to pursue the Holy Grail only through the path of parliamentary elections”. “In conclusion this is what I have to say: I admit that the capitalist class has been temporary victorious. But I do not see it as a defeat for the proletariat. This is only a big retreat for the proletariat; yes, I call it a big retreat. A retreat is not a defeat, but a phase from which it is possible to recover and march again to certain victory”. “No revolutionary movement has raced non-stop to victory in a straight line from start to finish. Forward marches followed by retreats are quit common in revolutionary movements”. “I remain an unrepentant Marxist and what I am defending here are Marxist principles rather than my person. For as a revolutionary Marxist I have nothing else to defend”. More buds will bloom and multiply”. “The poet expressed himself in clear and plain terms. The flowers of revolution have blossomed, but now they lie withered and dead. But their perfume has not yet ceased. To enhance that perfume and with that aim in view other buds will continue to bloom”. “In fact, gentlemen, the capitalist cause has no real reason to celebrate its success. For in the class struggle victory is a see-saw until the proletariat finally emerges victorious”. ‘We may be killed but our voice will never die’. That is our belief. I have concluded my evidence”. « Dilan Perera Envied by Colleagues as Upeshka Swarnamalie Requests and gets Post to Monitor his Ministry.